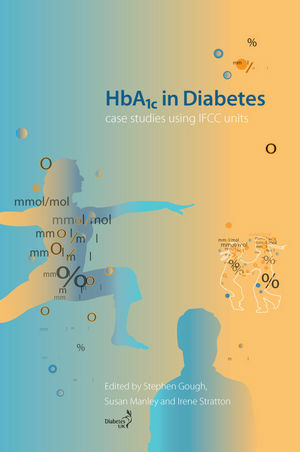 Adapting to the IFCC system of reporting HbA1c poses a challenge to generations of health professionals who have learnt the percentage system related to the major clinical trials, in type 1 and type 2 diabetes, the DCCT and UKPDS. This handy paperback illuminates the transition path. Using real-life case studies to illustrate actual clinical situations, the book shows you how to use mmol/mol units in daily practice. Each case study shows the old percentage units alongside the IFCC units for quick comparison. Produced in association with Diabetes UK, this pocketbook helps you work with confidence in the IFCC system. Stephen Gough is Professor of Medicine and Hon. Consultant Physician, University of Birmingham and University of Birmingham NHS Foundation Trust.? He has had 85 articles published on PubMed. Susan Manley is a clinical biochemist at the Department of Clinical Biochemistry, University Hospital Birmingham NHSTrust, Birmingham, UK. ?She has had 27 articles published on PubMed. 1 Diagnosis and early management of type 1 diabetes in a young child (Julie A. Edge). 2 Management of a very elderly client, housebound and living alone (Chris Cottrell and Helen Green). 3 Gestational diabetes (2) (Jonathan Webber). 4 Weight loss and improved glycaemic control (Pamela Dyson). 5 Type 2 diabetes in a child (Timothy G. Barrett). 6 Weight reduction (G. Pooler R. Archbold, Ailish Nugent, RW Henry). 7 Improved glycaemic control (Steve Creely). 8 Risk of hypoglycaemia in a client in an elderly mentally ill unit in a nursing home (Chris Cottrell and Helen Green). 9 Structured education for type 1 diabetes (Pamela Dyson). 10 Woman with family history of raised cholesterol and diabetes (Robert Cramb). 11 Type 1 diabetes in a child (Timothy G Barrett). 12 Poor glucose control with microvascular complications (Sarah Griffiths and Parth Narendran). 13 Renal failure and cardiovascular disease in an Asian patient (Alex Wright). 14 Type 1 diabetes in a teenage girl concerned about weight (Julie A. Edge). 15 Glycaemic control through patient empowerment (You Yi Hong, Maire O'Donnell, Sean Dinneen). 16 Diagnosis and early management of type 2 diabetes in acute coronary syndrome (Maggie Sinclair Hammersley and Daniel Hammersley). 17 Incretin or insulin (Richard Paisey). 18 Type 2 diabetes and pregnancy (Nick Lewis-Barned). 19 Deterioration of pre-existing diabetes in a patient on low dose quetiapine Valeria Frighi (Matthew Stephenson). 20 Low HbA1c and risk of hypoglycaemia (Jonathan Roland). 21 Rapid changes in glycaemic control and retinopathy (Adele Farnsworth and Alex Wright). 22 Type 1 diabetes in a young man moving from paediatric to young adult services (Nick Lewis-Barned). 23 Monitoring glycaemic control: HbA1c or fructosamine (Sarah Moore). 24 Pre-pregnancy and pregnancy in type 1 diabetes (Ciara McLaughlin and David R. McCance). 25 Maturity onset diabetes of the young, subtype HNF1A (HNF1A-MODY) (Amanda Webster and Katharine R. Owen). 26 'Overtreating' type 2 diabetes (Simon Heller). 27 Diabetes and an elevated triglyceride concentration (Robert Cramb). 28 Multiple therapies leading to bariatric surgery (Ernesto Lopez, R. David Leslie). 29 Optic neuropathy (Richard Paisey and Rob Willox). 30 Uncertainty around the estimate of average plasma glucose from HbA1c (Eric S. Kilpatrick). 31 Antipsychotics (Richard I.G. Holt). 32 Abnormal liver function in a patient with type 2 diabetes (Joanne Morling). 33 Fructosamine in diabetic nephropathy (Stuart A. Ritchie, John A. McKnight and Susan E. Manley). 34 Recurrent hypoglycaemia caused by secondary adrenal insufficiency (Athinyaa Thiraviaraj, Hamza Ali Khan, Ailish G. Nugent, G. Pooler R. Archbold). 35 A patient with diabetes taking niacin (Richard Haynes and Jane Armitage). 36 Tight glycaemic control leading to nocturnal hypoglyaemia (Rikke Borg). 37 Diabetes and iron-deficiency anaemia (W Garry John and Tara Wallace). 38 Deterioration in vision after commencing insulin treatment (The early worsening phenomenon) (Peter H Scanlon). 39 Type 1 diabetes – Worsening glycaemic control on introduction of a pump? (Ken Sikaris). 40 Monitoring glycaemic control in patient with sickle cell trait (Andrea Gomes, Lis Chandler, Rachel Round and Janet Smith). 41 Balancing fear of hypoglycaemia with optimal control in pregnancy (Roy Taylor). 42 Asian patient with high-risk feet and suboptimal glycaemic control (Varadarajan Baskar). 43 Type 2 diabetes and polycystic ovarian syndrome (M Ali Karamat). 44 Impact of variant haemoglobin AC on HbA1c determination (Laura Hikin, Jackie Carr-Smith, Rachel Round and Janet Smith). 45 Diabetic nephropathy (Sally M. Marshall).